GovernorWallace is a Legacy Library. Legacy libraries are the personal libraries of famous readers, entered by LibraryThing members from the Legacy Libraries group. » George C. Wallace's catalog. 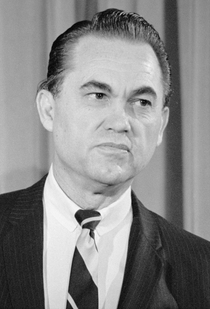 » George C. Wallace's legacy profile. GovernorWallace is also an author. » See George C. Wallace's author page. About meGeorge Corley Wallace (1919-1998) was the 45th governor of Alabama and one of the two longest-serving governors in U.S. history. He is best remembered for his vow to defend racial segregation and to "stand in the schoolhouse door" to keep black students out of schools designated for white people. During his four unsuccessful runs for the presidency of the United States (1964, 1968, 1972, 1976) Wallace perfected a style of populist, anti-government, racially encoded rhetoric that influenced the rightward political turn of both major political parties in subsequent decades. A former boxer from Clio, Alabama, Wallace earned a law degree and began his political career in the state legislature, then as a circuit judge. He was a member of the Alabama Democratic Party. Wallace served four terms as governor (1963-67, 1971-75, 1975-79, 1983-87), plus a year as "chief advisor" while his wife served as elected governor until her death of cancer in 1968. In 1972, while campaigning for the presidency in Maryland, Wallace was critically wounded by gunman Arthur Bremer. During his painful recuperation he renounced racism and became a "born-again" Christian. In the 1982 race for governor, after narrow victories for Wallace in Democratic primary elections, a majority of black voters in Alabama chose Wallace over the Republican candidate. It was Wallace's fourth term as governor, a record matched only once in U.S. history, by Ohio Gov. James A. Rhodes. Wallace was a formidable campaigner but accomplished little while in office. His legacy to Alabama includes a reactionary political tradition in which politicians avoid acting on pressing problems unless compelled to do so by federal court rulings. During Wallace's tenure, Alabama's mental health facilities were compared to concentration camps, and the state's routine treatment of prison inmates was judged "cruel and unusual." As a young legislator, Wallace did help establish an extensive two-year college system. As a mature governor, however, he failed to solve the state's chronic fiscal problems, and his most enduring achievement was to establish a trust fund to receive windfall revenues from natural gas drilling in state-controlled waters in the Gulf of Mexico. Wallace was married three times. His first wife, Lurleen Burns Wallace, died of cancer in 1968 while serving as governor in her husband's stead. He divorced his second and third wives, Cornelia Stively Wallace and Lisa Taylor Wallace. He and Lurleen Wallace had four children. Wallace is the author of one book, Stand Up for America, and the subject of numerous biographies and political studies. About my libraryThe personal library of George C. Wallace is in the collection of the Alabama Department of Archives and History, Montgomery, Alabama.